Home » Education » What is a Oscilloscope? In this page we will learn what is a Oscilloscope and why it is used as an electronics instrument in laboratories. An oscilloscope is a laboratory instrument commonly used to display and analyze the waveform of electronic signals. In effect, the device draws a graph of the instantaneous signal voltage as a function of time. The Y-axis shows the voltage level and the X-axis shows time. 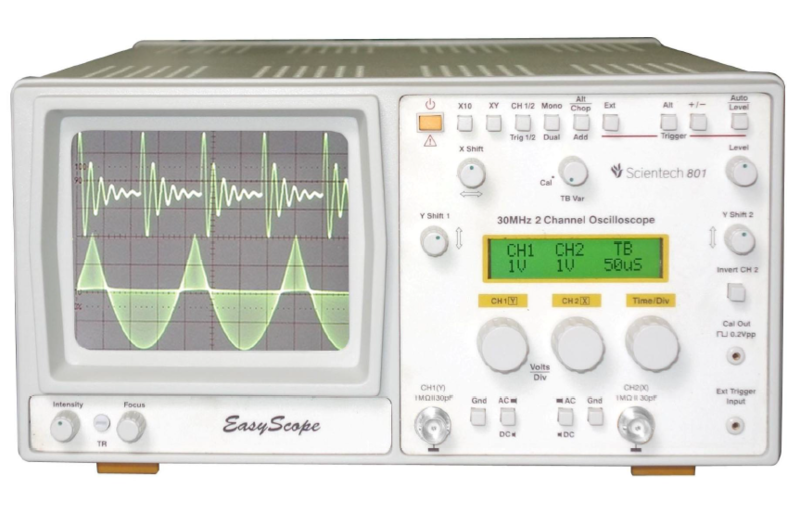 The oscilloscope displays peak to peak values of the electrical signal. What is a Oscilloscope: It is an electronic display device containing a cathode-ray tube (CRT) that generates an electron beam that is used to produce visible patterns on a phosphorescent screen. The graphs plot the relationships between two variables. The horizontal axis normally being a function of time and the vertical axis usually a function of the voltage generated by the input signal. Because almost any Physical phenomenon can be converted into a corresponding electric voltage through the use of a transducer, the oscilloscope is a versatile tool in all forms of physical investigation. The German physicist Ferdinand Braun developed the first cathode-ray oscilloscope. What is oscilloscope used for? What is triggering in oscilloscope ? Trigger function in an oscilloscope is important to achieve stable and clear signal characterization, as it synchronizes the horizontal sweep of an oscilloscope to the proper point of the signal. The trigger control enables users to stabilize repetitive waveforms as well as capture single-shot waveforms. By repeatedly displaying similar portion of the input signal, the trigger makes repetitive waveform look static. Oscilloscopes offer various types of trigger functions, the most basic and common type is the edge triggering. Just like edge triggering, threshold triggering, is another type of trigger function that is offered both in analog and digital oscilloscopes. Oscilloscope Bandwidth is defined as the point at which the amplitude of a sine wave input is reduced by 3 dB (approximately 30%) relative to its level at a lower reference frequency. In other words, bandwidth is specified at the frequency at which a sinusoidal input signal is attenuated to 70.7% of the signal’s true amplitude. It determines an oscilloscope’s fundamental ability to measure a signal.